you can see the new statue of De Gaulle … ' (Kevin Connor, from ABC interview, 4 August 2005). short concentrated periods. While walking adjacent to the Grand Palais during a visit in 2003, he found himself in direct line of view with two statues of Clemenceau and De Gaulle, and was inspired to make a pen and ink sketch as they appeared to him: two figures seen in dramatic perspective, from the grand-scale foreground rear view of Clemenceau with greatcoat and fluttering scarf, to the distant profile of De Gaulle, striding through a wintry parkland of wiry, leafless trees (ill in Hendrik Kolenberg, Sketchbook drawings by Kevin Connor in Sydney, Paris and London, AGNSW, Sydney, 2006). On working up his sketch to this larger drawing two years later, he inserted a small portrait of himself at work on the scene, at bottom left, in witty conjunction with these two elder statesmen. 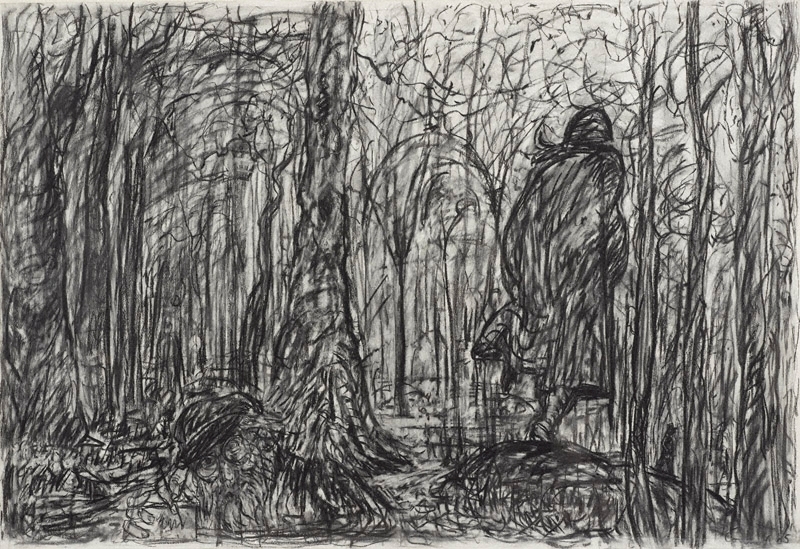 This work won the Dobell Prize for Drawing in 2005 and was acquired by the Gallery in 2005. Signed and dated l.r., charcoal "Connor '05".